Improve collaboration in your teacher group with these leadership tips. In any school system, even if we’re the superintendent we have people above us giving directions, people we consider colleagues working by our side, and people who look to us for leadership. As John Maxwell notes in his book The 360 Degree Leader, you don’t have to be the official leader in order to help make the group you work with effective. One of the fundamental principles Maxwell discusses in the book is that in order to do this we have to lay aside our need to get credit. We have to believe that if the team is successful, it doesn’t matter who gets credit. We know that collaborating with fellow teachers on helping students is one of the best ways to make great strides in student performance. 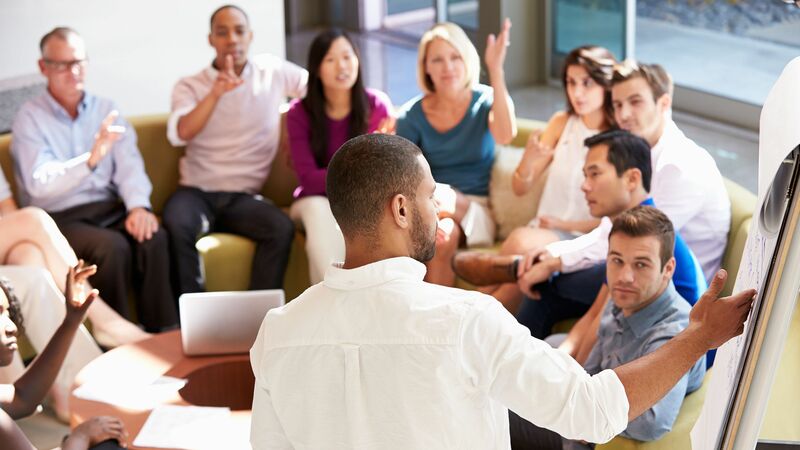 A member of a teacher team or professional learning community (PLC) can have a great influence in the productivity of their group around that collaboration. In his book, Maxwell encourages regular members of a group to lead upward, lead horizontally, and lead downward. What makes one PLC phenomenally effective and productive and another not so much? In my experience, a successful PLC always possesses more than one person who leads up, leads horizontally, and leads downward. When a team of teachers operates effectively, there is one group leader and usually five to six committed educators who are all working together to meet student needs. Just as you may have to “manage up” at times with your principal (for example, by reminding them of a meeting or that it’s time for your yearly review), you will at times need to lead up with your PLC leader. A key goal is to make the leader look good (and feel good) by helping them be more effective—rather than overstepping and infringing on their leadership, offer to assist them. What Maxwell suggests is that you anticipate your leader’s needs so that your actions complement what they’re doing. Anticipate what will be needed for the PLC meeting to be successful. For example, don’t wait to be asked to get the data ready for the meeting. Another thing you can do is to take some of the burden off of the leader, especially in areas of urgency. You might offer up something like, “Please let me help with making the copies and binders for the PLC meeting next week.” They will most likely be grateful for the help. Leading up also includes staying fully engaged during your meetings (difficult after a long day teaching, I know). If you are supportive and enthusiastic it will much easier for the your teacher colleagues to be so as well. Stay connected with your colleagues between the meetings through hallway chats, email, and social media. In striving to help your learning team be effective, share the gems of knowledge gained from staying abreast of research-based practices you gain from your subscriptions to educational newsletters and journals, your participation in education discussions online (on Facebook, LinkedIn, Twitter), or your own investigation into something you want to improve upon. You can also encourage your colleagues to build trust by listening and using effective communication skills. One of Sean Covey’s The 7 Habits of Highly Effective Teens says that we should seek to understand and then to be understood. The most important way to build trust for open dialogue is by avoiding criticism in the group. Be sure to talk about the facts, not the teachers. If there is an unresolved disagreement in the group, suggest that time be taken in the meeting to address the tensions and work toward a solution or some kind of shared agreement. Also, in meetings, make an effort to ask new teachers what they think as often as you can and offer to be their partner on group projects and action research.